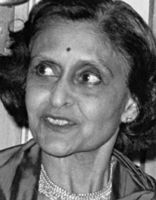 Boston, 21 May 2004 – Indo-British novelist Kamala Markandaya, whose works were first published in the 1950s, passed away Sunday May 18 at her home in the outskirts of London. Markandaya was 80, and had settled in England since the age of 25, following her marriage to Bertrand Taylor. Her daughter Kim Oliver survives her. Born Kamala Purnaiya in a small town in Mysore in 1924, Markandaya attended the University of Madras, beginning in 1940, where she studied history. From 1940 to 1947, she worked as a journalist and also published short stories in Indian newspapers. During the war she worked for the army in India and later returned to journalism. Fame and success came with her first published novel, Nectar In A Sieve (1954), a Book-of-the-Month Club Main Selection and bestseller in the United States. In 1955, the American Library Association named it a Notable Book. That novel was followed by nine others: Some Inner Fury (1955), A Silence of Desire (1960), Possession (1963), A Handful of Rice (1966), The Coffer Dams (1969), The Nowhere Man (1972), Two Virgins (1973), The Golden Honeycomb (1977), and Pleasure City (titled Shalimar in the American edition, 1982). In the US her early novels were published by John Day and Co, the same outfit that published the works of Jawaharlal Nehru. From the 1960s onwards it was a common sight to find Markandaya's novels on the shelves of used bookstores throughout America, as well as in every public library. At least twelve Ph.D. theses have been written in American and British universities analyzing Markandaya's writings. Parameswaran is the author of a study of Kamala Markandaya in the Writers of the Indian Diaspora series, edited by Jasbir Jain, and published by Rawat Books in 2000. All of Markandaya's novels reveal her deep preoccupation with the changing Indian social and political scene, her careful, conscious craftsmanship and her skilful use of the English language for creative purposes. She excels in recording the inner workings of the minds of her characters, their personal perplexities and social confrontations. She endeavored to portray them as individuals growing into themselves, unfolding the delicate processes of their being and becoming. In their encounter with a alien political power, the anticolonial or anti-imperialist attitudes are powerfully expressed and Markandaya's major characters project these viewpoints. Her Nectar in a Sieve, said to be reminiscent of Thomas Hardy's novels, was published in 1954 and made her widely known. It is a restrained as well as a touching account of the life of an Indian peasant woman, Rukmani, and her struggle for survival and her abiding love for her husband, Nathan. However, in The Nowhere Man Markandaya is more concerned with unfolding the sense of alienation of Srinivas, or the modern man. In this novel political considerations occupy a secondary place, the primary purpose being to highlight the isolation of the individual soul and expose the pathos of the human condition. Markandaya succeeds in achieving the delicate balance between unfolding the individual's psychological and social predicaments and portraying a wider cultural and political setting which create these crises. This balance is the hallmark of her success as a novelist and it highlights her distinctive art in the choice of her themes and her skilful craftsmanship. Some Inner Fury presents Mira's conflicts as she is divided between her ardent and genuine love for Richard, an Englishman, and the compelling political forces of Indo-British turmoil. These forces pull them apart and her mind, once reveling in romantic love, returns to the harsh realities of life. Some of her novels seem to be autobiographical though she is reticent in talking about herself; they at least present the first person omniscient narrator. Nectar in a Sieve and The Nowhere Man are her finest creations, which will ensure her a place among the modern Indo-English novelists of distinction. Rochelle Almeida, who teaches Post-Colonial Literature and South Asian Civilization at New York University and has explored »Indianness in the Novels of Kamala Markandaya« has dissected the influence of Markandaya's upbringing and early experiences in India together with those gleaned following her emigration to England. She does this by drawing liberally upon Markandaya's own comments on her life and personal conversations with the novelist and is able to explore every facet of Markandaya's creativity from theme and character to language and setting. Markandaya's entire canon of ten novels was produced over a period of three decades. She has not produced any novels in the past 22 years. A sensitive American educator observes that Markandaya's work reminds us that 50% of the earth's population is female and that in many ways, women are responsible for much of the stuff of history. Markandaya reminds us that not only are women important and enduring individuals but also that the plight of rural women in developing countries is one that is more often the norm than many of us either realize or appreciate. An Indian American writer, Indira Ganesan, writes of Nectar in the Sieve: 'This is a very short book but don't let that fool you. There is so much packed into this little novel that if you blink you miss something. In some ways it is a very hard read in the fact that it is so realistic. After I read the book, I was shocked to find it out that it was written over 45 years ago. It is so modern and forward thinking that I assumed it had been written in the past year or two. At its core is Rukmani, a peasant Indian girl who marries her husband at age 12. Many literary analysts such as Meena Shirdwadkar have suggested that the value of suffering is an important component of Markandaya's novels because she portrays her positive woman characters as ideal sufferers and nurturers. Nectar in a Sieve was Kamala Markandaya's first novel to be published, although it is actually the third novel she wrote. The novel, published less than a decade after India won its independence from Britain, is clearly influenced by this event, portraying some of the problems encountered by the Indian people as they dealt with the changing times. Markandaya never mentions a specific time or place, however, which gives the story universality. Some of the struggles that the main character, Rukmani, faces are the result of the changing times, but they are the kinds of struggles (poverty, death, loss of tradition) that are experienced by many people for many reasons. Far beyond its political context, the novel is appealing to modern readers for its sensitive and moving portrayal of the strength of a woman struggling with forces beyond her control. It is a story about the resilience of the human spirit and the importance of values. Essentially, that happens to be the overriding theme in many of her novels. *Article originally published by Indolink. Copyright © by Francis C. Assisi. Some quotes are © by Uma Parameswaran.